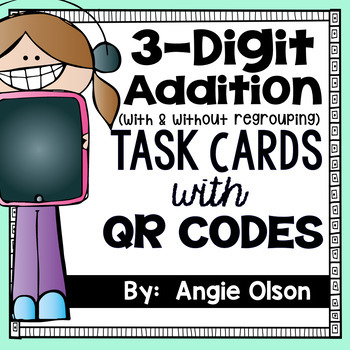 3-Digit Addition with QR Code Task Cards are a fun activity that you can do with your whole class or as a small group center. It will get your students up and moving from desk to desk while they solve math problems. This activity can be used as a review, practice, or even assessment. After printing the following slides, cut them out and place one task card on each desk. Each student will need a record sheet. Students will start at their own desk. They need to find the sum of the 3-digit addition problem on the task card. Then the teacher says, “Scoot” and at that point the students need to move to the next desk to solve that task card. The activity will continue until all the task cards have been solved by each student. Corrections can be done together as a whole group for reinforcement/re-teaching or done by the teacher. This product contains 24 3-digit addition with regrouping task cards with QR codes, 24 3-digit addition without regrouping task cards with QR codes, direction sheet, recording sheet, and answer key. The QR codes are linked to simple text that provides the answers for each math problem. This allows for self-correcting opportunities. The 3-digit addition recording sheet includes a self-monitoring piece for each problem. Your students will find the total value, write the amount, scan the QR code, check if the answer is correct and circle YES or NO at the bottom of each answer box.